For this outing, I took with me only the Tombow brush pen color 947, a waterbrush, and my Hero bent nib pen loaded with DeAtramentis Document Black ink. My goal was to work with black and one color, just to see what the effect would be. My bummer of the outing was that my favorite fountain pen, the Hero bent nib, which has never failed me, got persnickety--I couldn't get a thin line out of it. Perhaps it needs cleaning. But that limited what I had planned to do. On the other hand, I improvised and still had a good time. Lesson: never go out with just one ink pen! 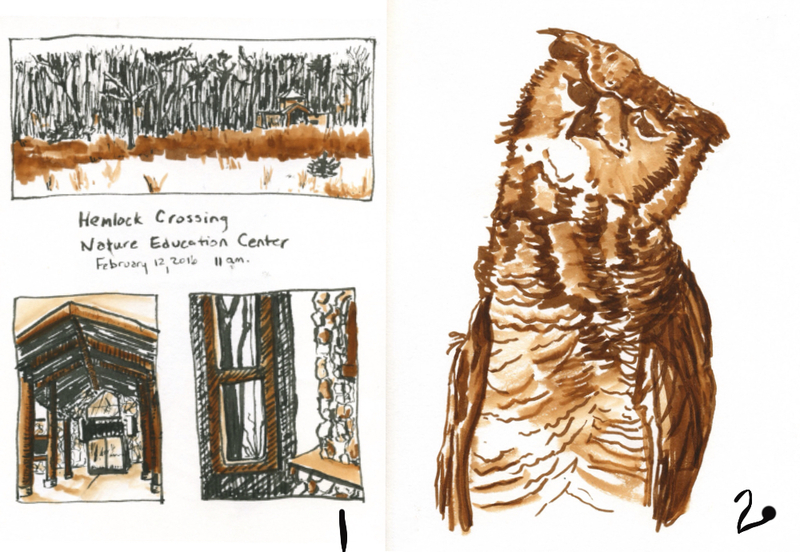 Page two above is a study in just the brush pen (with help from the waterbrush) of a taxidermied Great Horned owl. It was sitting up on a high mantle, and though they offered to get it down for me, I left it where it was and did the drawing from beneath (this is how I see the real thing in my woods, after all). This was a great exercise for me in measuring, restating lines, and shading for volume. I do think the owl sketch conveys more of a smirk than the actual owl had (or than I intended). What I like: a lot, frankly, but one thing I really like is the perspective of the columns on the doorway (bottom left, page 1). Nailed it! And the whole owl. There I see progress with stamina (it took about 35 minutes) and attention, as well as with values. I look forward to continuing to improve with values--seeing them, representing them. Looking forward to lots more practice. This post comes from work I did in a class with Roz Stendahl, Drawing Practice: Drawing Live Subjects in Public. I recommend it!